This year in Atlanta, the American Society of Criminology held its 74th Annual Meeting from November 14 – 17, under the theme “Institutions, Cultures and Crime.” More than 150 John Jay faculty, research staff, and students attended the conference with the purpose of presenting their scholarship and learning more about the work of criminology taking place in institutions around the world. To share the presenters’ work with the entire John Jay community, we’ve put together a roundup of highlights from the event. Joshua D. Freilich, is both a professor of criminal justice as well as the creator and co-director of the School Shooting Database. In his presentation on “Understanding the Causes of School Violence Using Open Source Data,” Freilich was able to release some preliminary findings from analysis of the database—which includes incidents from 2006-2016—after more than a year of collection and study. Freilich noted that, while the media tends to focus on non-typical instances of mass casualty incidents in schools, most are non-fatal. In another notable departure from the common narrative, his data showed that school shootings do not seem to be increasing in number, and shooters, though often portrayed as irrational actors, do appear to be making rational choices, and are therefore likely susceptible to diversion or prevention by effective interventions. As the movement to close the jail complex on Rikers Island gathers momentum, New York City will need to see a significant reduction in the jail population in order to find capacity to move those currently incarcerated there to other carceral facilities. In a session sponsored by the Misdemeanor Justice Project (MJP), John Jay graduate students Quinn Hood, Olive Lu, and Shannon Tomascak presented papers exploring aspects of how this could be accomplished. In one project, Hood noted an unexplained increase in the number of “bed days” for certain categories, which drives up numbers of incarcerated despite dropping admissions numbers. And, in conjunction with New York’s Raise the Age legislation, Lu investigated whether the dynamics of criminal justice involvement for different age groups aligns with current scientific findings. Her data suggested that, while there are significant differences across age groups, emerging adults (ages 18-25) do not stand out in ways that suggest they present higher risk, raising the possibility of whether this group should still be treated as “juveniles,” a population that will no longer be housed in the Rikers facility. Police-involved shootings are a prevalent and emotional topic in today’s news. 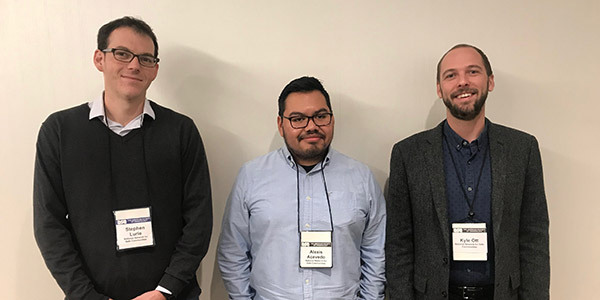 Graduate and undergraduate students Daniella Rice, Jason Rampersaud, Marilyn Reyes, and Magdalena Jablonowski, under the guidance of Professors Hung-En Sung and Frank Pezzella, explored different factors that may have a significant relationship with fatal officer-involved shootings. A diverse range of variables, including departmental use of force policies, racial dynamics, citizen hostility and regional culture, were considered. The presentations were followed up by a lively debate with input from active and former police, students and faculty on the role of race and what conditions would be important to consider in future research. Suggested conditions included availability of life-saving care and the use of other means of violence apart from guns. The State Department’s Diplomacy Lab is a partnership program that enables the State Department to “course-source” research and innovation related to foreign policy challenges by harnessing the of students and faculty experts at colleges and universities across the United States. One such project was led by Professor of Sociology Rosemary Barbaret, whose students reported on radicalization and disarmament, demobilization, and reintegration (DDR) policies in other countries that could be applied to U.S. policy in Iraq. Elizabeth Aguilar, Catherine Minaya, Sarah Durrant, and Rachel Fiegler outlined DDR best practices in Uganda and Colombia, with an eye toward what would work best to reintegrate child soldiers swept up by the Iraq conflict. Lilla Heins discussed her research into Islamic radicalization in the South Caucasus, sharing her recommendations for dealing with returning soldiers. The session wrapped up with a talk-back with a Foreign Service Officer, including avenues for future research. An all-John Jay immigration-themed panel featured Sociology Professor David Brotherton and two Criminal Justice Ph.D. alumni, Borough of Manhattan Community College Professor Shirley Leyro, and John Jay’s Research Director Daniel Stageman. Leyro began with preliminary data from her seminal CUNY Belonging Study, which explores feelings of belonging and membership among CUNY noncitizen students. Stageman and Brotherton then presented on their current projects, focused respectively on the explosion of local police involvement in immigration enforcement under the Trump administration, and the wanton cruelty on display in deportation court. Since its 2014 launch, the National Initiative for Building Community Trust and Justice (NI), coordinated by the National Network for Safe Communities (NNSC), has produced substantial increases in community trust and confidence in police among its six pilot sites, the Urban Institute announced during a panel on Wednesday, November 14, previewing findings from its formal NI evaluation. The Urban Institute also found that police departments from the six NI sites have, likewise, bought into the initiative’s core ideas—enhancing procedural justice, reducing the impact of implicit bias, and fostering reconciliation. Earlier this year, NNSC released an extensive report on Reconciliation Between Police and Communities. “Actual exposure to the content of the National Initiative’s three pillars won people over,” despite some initial skepticism, NNSC Director David Kennedy said. He credited much of this success to clever strategies law enforcement agencies employed to encourage buy-in, both in their communities and within their departments. On ASC’s second day, NNSC Research and Policy Advisor Stephen Lurie, Data Analyst Kyle Ott, and Data Analytics Associate Alex Acevedo showcased empirical proof for one of the organization’s key research findings—that a tiny portion of a community’s population is responsible for a disproportionate amount of its violence—during a presentation on groups and the extreme concentration of urban violence. 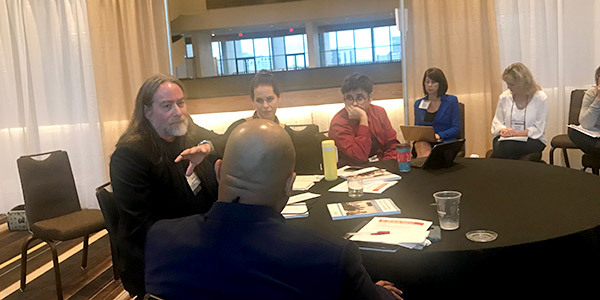 Lurie, Ott, and Acevedo incorporated data from 23 sites that NNSC’s Group Violence Intervention (GVI) has worked with since 2014 to illustrate that less than 1 percent of the sample cities’ populations were connected with roughly 50 percent of homicides and non-fatal shooting incidents. Their presentation is part of a paper that will be submitted for peer review.